Imagine gazing upon beautifully-crafted, delicate confections. Eyes dance over the gorgeous display case, dashing from tray to tray. Mouths water while reading placards with names such as orange dreamsicle, strawberries and cream, and milk chocolate basil and cracked black pepper. Antici-pation builds as thoughts swirl imagining the first bite. Welcome to honey B’s macarons. To clear up any possible confusion, there is a difference between a macaron and a macaroon – besides the additional “o.” A macaron describes a particular type of cookie that is a meringue-based treat sandwiched together with a filling A macaroon, on the other hand, is a somewhat generic term that describes a cookie usually made with coconut and is dense and chewy. With a recipe created, it was time for a name. Naherny’s nickname for her husband Brent is “Honey B,” and since he tended to the hives that produced the honey for some macarons, the name “honey B” seemed most appropriate.After using a commissary in Lakewood for more than two years to make her macarons, Naherny decided it was time to take the leap into opening a store. 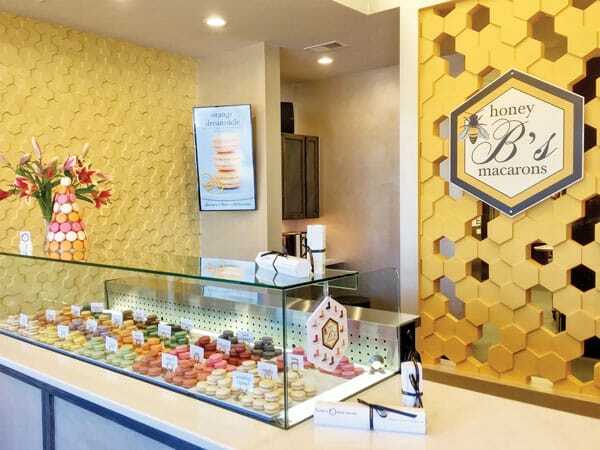 Honey B’s macarons, located in Highlands Ranch, opened in March 2016 and has already garnered a large following. The success is no doubt due to Naherny’s attention to detail, creativity and passion for bringing delicious macarons to the area. When confections are made using only a few ingredients, it is important that those ingredients are the finest an freshest possible. Naherny only makes honey B’s macaron shells with egg whites, almond flour and granulated an confectioner’s sugars. The confection is then filled with handmade fillings su as creamy ganache, luscious buttercream or fresh jam. Honey B’s macarons, which are gluten-free, do not contain any artificial flavors, fillers or swee-ers. And while Naherny can customize the shell colors and flavors for we-dings, showers and corporate events, only FDA-approved edible ink is used. Walking through the doors at honey B’s macarons is like stepping into a beehive except with a different type of worker bee buzzing around. The warm honey-toned walls reflect a hives colors with a playful honeycomb pattern. The sleek, uncluttered space is more like a boutique, and with the exception of selling honey, Naherny has no plans to add other products. On a daily basis, honey B’s macarons offers 12 classic flavors such as vanilla coconut, lemon, salted caramel and their signature honey macaron, which is made with honey from one of three Naherny backyard hives. Daily flavo specials may include coffee, lavender, jalapeno, and strawberry temptation. 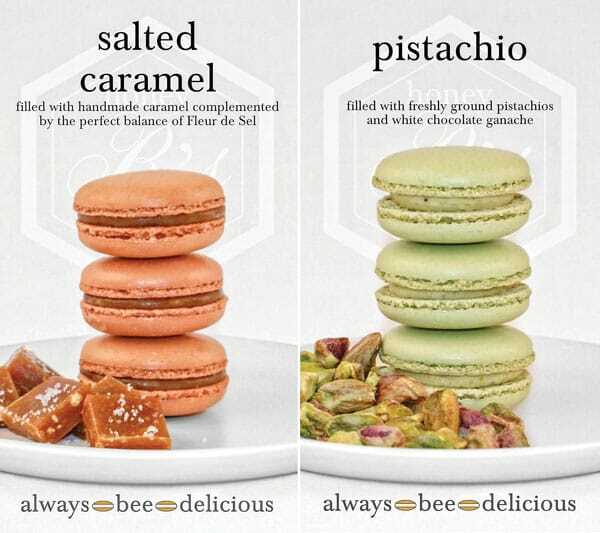 To try a sampling of flavors, be sure to sto by honey B’s macarons for Mini Mac Monday when selected treats are bite size and offered at a lower price. After tasting several varieties, I quickly realized that honey B’s macarons are not a “fill your cookie jar” type of cooki – although any cookie jar would be honored to hold such a delicacy. These treats are meant to be savored, and knowing my child would not appreciate the subtle tastes, I opted to hide my honey B’s macarons. Macarons are characterized by their smooth shiny tops and ruffled edges. M first honey Bs macaron was coffee, and as I bit into it I encountered the thinnest layer of crispy shell before hitting the creamy meringue and then the delightful filling, which was just the perfect amoun of sweet. Interestingly, all macaron shells taste the same and the flavo comes from the filling. The pistachio macaron, with its freshly-ground nuts, had a burst of flavor that made me exhal in pure contentment. The rose macaron tastes exactly like a rose smells, which is courtesy of the rose essence coming from France. (The lavender macaron is also made with lavender imported from France, but that was not a daily special on my visit.) Each tiny domed treat was a flavorful, tende, light and sweet experience. Macarons can be purchased online or at the store and individually or in bulk. Naherny specializes in towers holding 60 macarons or tiered stands displaying up to 237 delicious treats. 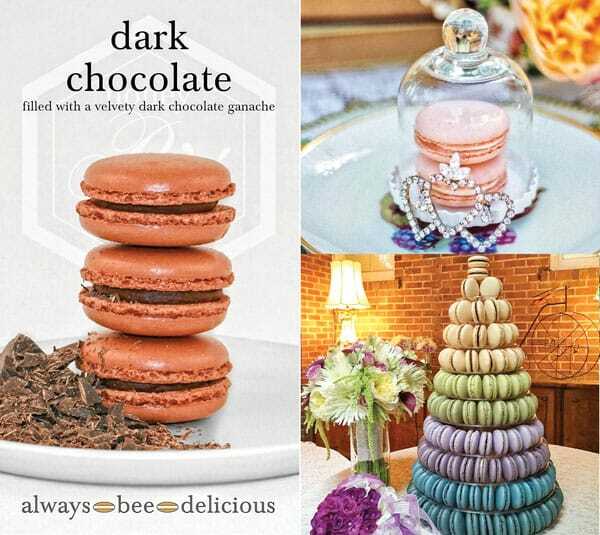 Honey B’s macarons also offers engraved bell jars, favor bags, and gift boxes to accommodate various events. Follow honey B’s macarons on Facebook and Instagram for daily specials and current inventory.